As I was working on a presentation I gave on the data models MAM systems are built upon, I realized that looking at the evolution of these data models was a nice way of explaining them. It only made sense to share it with a wider audience. By illustrating how media assets are tracked and catalogued within a MAM system, and how that model has changed significantly over time, I hope to provide a deeper understanding of the changing needs in our industry and how we can not only continue to address these needs, but also begin to predict and plan for new ones. Lets take look at what I call the Dark Ages of MAM, when our operations were almost exclusively tape-based, and there was no real MAM system. What we had were tapes with stickers (metadata) on them or, best case scenario, a tape management database. 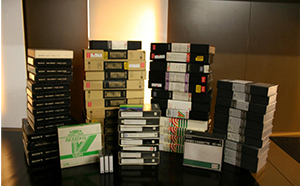 Then, as professional media workflows started to introduce file-based workflows, we saw the first MAM systems appear, i.e., a digital catalogue to organize and track your media assets. This is a time I call the Stone Age. The asset was represented in a very simple way: one descriptive metadata set that pointed to one media file (audio or video). This was intended to allow users to search for and find their media assets, along with some information on them. Then, things got a bit more complex in the Iron Age. We no longer had a single file attached to a metadata record. You needed multiple versions of that media asset, in multiple formats; lets say one version for proxy viewing, and a few different versions for archiving, distribution to FTP or web sites, etc. And then again, as time went by, things became even more advanced, and we reached what I would call the Industrial Age. The asset was not just a single media file anymore; it became a combination of many individual building blocks, with a master video track, individual audio tracks for multiple languages, caption or subtitle files, and even secondary video files and still images. And from this you then had to create different virtual versions, each with a different subset of files and their own specific metadata, in order to manage and track the delivery to the many new linear or non-linear platforms. And of course, all of these needed to be linked in order to track the various relationships. This Industrial Age, as I like to call it, is the time we are in today. 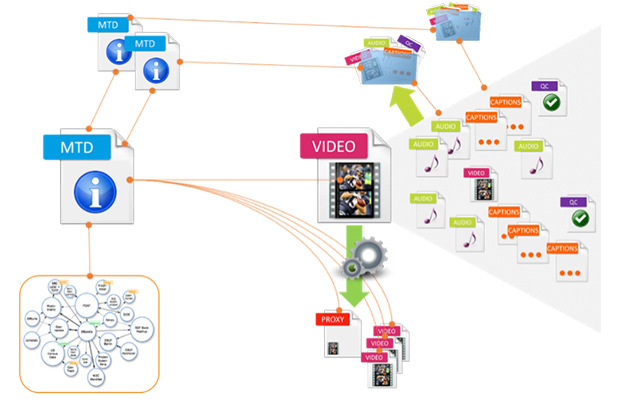 The complex data model I describe above allows us to automate production and delivery workflows in an efficient way, by building media production factories for delivering multilingual, multiplatform content. And since a number of standards have recently emerged for delivering these complex bundles (AS-02 and IMF, for example), we have really reached a point where the full preparation, assembly and delivery workflows can be highly optimized. As the term evolution would imply, this Industrial Age is just another phase in the progression of MAM platforms, which are only going to become more advanced and more complex in the future. The next challenge for MAM platforms (or more accurately, the engineers who develop them) will be to include in their data model all the new requirements and paradigms of social media platforms and semantic technologies. The MAM data model will need to be aware not only of whats happening inside the media factory but also of everything happening in the whole wide world of the semantic web. It looks like its going to be a lot of fun for engineering teams ;-).